I have a really limited number of A5 sized Golden Dawn Temple Deck major arcana available which I am selling on a first come first served basis. 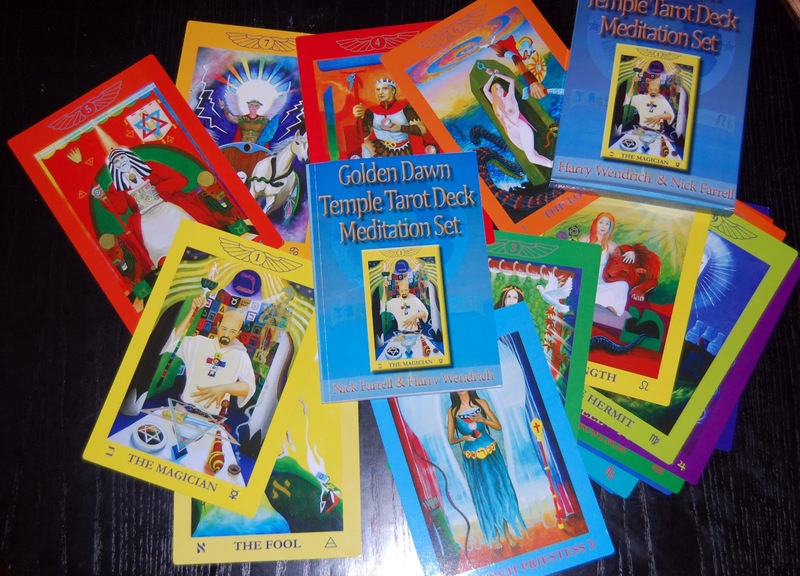 The 23 cards (there are two versions of Temperance) are A5 size and designed for meditation, but they could be equally used for ritual or talismans. The set also comes with a book written by Harry Wendrich and I, which explains how the cards can be used. In edition they are the first published deck to have the colours of the paths to aid meditation and create astral doorways. This set is a powerful magical tool and is designed for use! The photo does not really do them justice. We have printed only 100 sets of these and they were expensive to make. I have 50 of them and already have sold 10. You can order your set by emailing me here each set costs £50 and registered postage and packing is another £15 .Payment is by paypal. We are currently pitching a full deck to various publishers. Has the global conspiracy bumped off David Griffin? Having bought and used one of these sets I can honestly say that I’m impressed. The imagery is beautiful and powerful, and the larger size is helpful for meditations, pathworkings, and for use in initiation ceremonies. An essential addition to any Golden Dawn initiate’s personal (or group) temple. Nick, these look great. You and Harry should be very proud of them. The colors look amazing.